If you’ve ever wondered who manages Bryant Park, read on for all the highlights of our organization. The Bryant Park Corporation (BPC) was founded in 1980 with a charge to reclaim Bryant Park for the people of New York City. Since then, the talent, dedication and execution of the BPC board and staff has transformed the park into the greatest public space in the world. The ongoing mission of BPC is: to create a rich and dynamic visual, cultural and intellectual outdoor experience for New Yorkers and visitors alike; to enhance the real estate values of its neighbors by continuously improving the park; to burnish the park’s status as a prime NYC tourist destination by presenting a meticulously maintained venue for free entertainment events; and to help prevent crime and disorder in the park by attracting thousands of patrons, at all hours, thus fostering a safe environment. 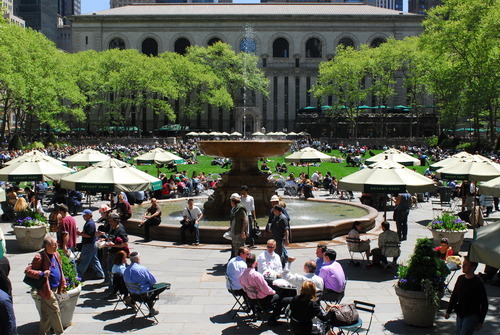 BPC is privately funded, and operates Bryant Park with private sector techniques and management methods. Working as agent for the City of New York, BPC provides sanitation, security services, spotless restrooms, colorful gardens, and seasonal horticultural installations for the park, and maintains a lush lawn that is open to the public. BPC also works with civic minded corporations and park patrons to offer interesting amenities, free educational programs and free high-level entertainment for people of all ages. Careful selection and management of concessionaires ensures that park visitors have access to high quality food and merchandise. As it strives to improve the park each year, BPC pays close attention to other models and constantly seeks innovations, whether from its own staff or from outside, always with an eye on the ultimate goal: presenting the perfect park to the public.